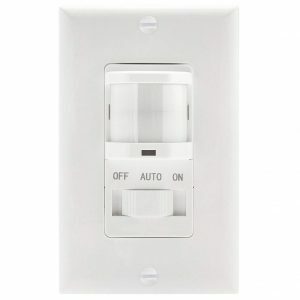 A Motion Sensor Light Switch is often also referred to as “Occupancy Light Switch” as well as “Vacancy Light Switch”. But there is a difference between the two. An Occupancy Light Switch automatically turns on the lights as soon as motion is detected in the sensor range and automatically turns the lights off when the motion is no longer detected in the range. With a Vacancy Light Switch, you still need to manually turn on the lights but the switch will take care of turning the lights off when the motion sensor no longer detects any activity. 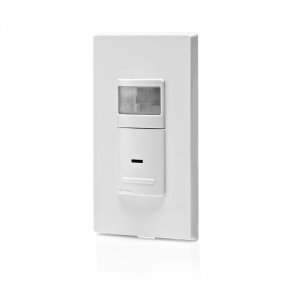 Lutron and Leviton are renowned companies that are specialized in the area of occupancy and vacancy sensors in combination with light switches. 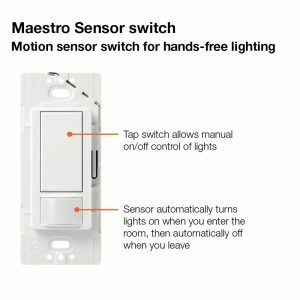 The Lutron Maestro is basically the flagship of motion sensor light switches. But also Belkin’s WeMo portfolio now contains smart motion sensor switches to control lighting. Around this technology there even is a new market evolving under the term “Smart Lighting” which refers to energy efficient and automated lighting systems. These systems should manage their own power cycles based on conditions like daylight times or occupancy. Not to mention the usual capabilities like programmable schedules, remote web interfaces or even smartphone apps. Almost all Motion Sensor Light Switches require to be grounded (this is the third wire beside the Black and White one). The reason for this is that most dimmers, timers and motion sensor switches require power to operate. Very often a neutral wire is not present in a switch which is why the clever engineers found a way to power the device via the ground conductor. You can precisely adjust the timing and sensitivity of these switches. So don’t worry about sitting in the bathroom while the lights go out. Although you can find similar stories on the Internet it is often just a matter of the right installation. A good home automation system takes time and patience. You know that situation when you enter the home or a room with hands full of the things, and you have to turn the switch on? Or your child wakes you up when goes to the bathroom at night through the dark hall? Well, in most cases this scenario can be skipped with a motion sensor light switch. You just walk in, and the light turns on. Today, models are very advanced. You don’t have to worry that, while talking with a friend or having a meeting, lights will turn off and you will all wave around to turn them on again. 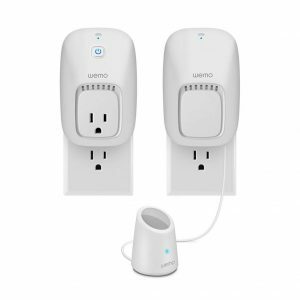 There are plenty of motion sensor light switches available on the market, and we already mentioned some of them (Lutron Maestro and Belkin’s WeMo). Now, let’s see what the best among them are and what their features are. On our top five list, the number five is Switch + Motion by Belkin. The company did their best to assure that you never walk into a dark hallway when returning home from work or a crazy night out. The Switch + Motion is not what you would really expect a switch to look like. It is not screwed into a wall instead of a traditional switch. But what it is and what it does? The Switch + Motion actually contains two components: the switch and the motion detector. The purpose of the switch is to plug in the electrical device. The motion detector controls the switch when it senses you have walked into the room. The devices are set up separately via mobile app and work well with both iOS and Android. Installation is easy and straightforward: After installing WeMo app and sending the credentials of your wireless network to the plug and the detector, you need to plug in the switch and follow easy instructions on the app. Once you make your login and password, you can control the switch from your mobile. Installation of movement detector is identical, but this time you will have to log into the detector’s wireless network. Now, after the excitement, after finished installation is over, you can start using the device. You can use the switch for plugging in any smart device such as coffee maker, lamp, fan or any other. Additionally, the sensor itself has a pale blue light which illuminates every time it senses motion, so if you place it in the hallway or bathroom, it is beneficial at night. You can create rules when to switch the device on or off control them from your mobile. For example, the switch can turn on your coffee maker before the alarm goes off, or turn on the light when the detector senses movement and then turn off after 10 minutes. If you still want to command the switch manually, it will skip the setup rules and instantly work as it’s told. The Switch + Motion gives you the opportunity to work with IFTTT so you can use different supported applications. There is, however, one thing that you might find questionable about this smart device: the motion detector has to be placed near the switch. But the cable is long enough so you can find a proper place for the sensor that will not be on your way. As this doesn’t affect its function, we won’t take this as a significant disadvantage. Considering all its features, we can say that the Switch + Motion is a right combination of smart features in two devices. It is an excellent device for the beginners in the world of smart home applications and will give you control of the desired device and light, it is easy to install, has a reasonable price and works well. So once you are hooked up to the benefits of smart devices with this one, go ahead and enrich your home with other more advanced devices. You’re going to love Switch+. You might wonder why would it have so many features integrated, but once you try all of them you are going to like it. Why? 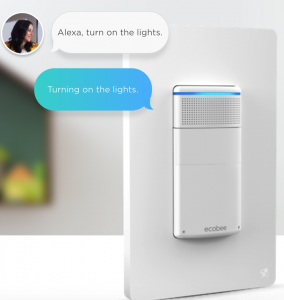 The Switch+ has so many things incorporated: it is a switch, has a motion detector, works wireless with ecobee thermostat (expecting this one soon) and, well, it doesn’t work with Alexa. It has it integrated!!! But let’s start from the beginning. The installation. First, you’ll have to replace your traditional switch. The instruction is, and the replacement should be easy, even though you’ll have to handle with wires and screwdriver. But once you’re done, set up of the application and starting the switch will be done in a couple of minutes. You need to download the app and follow instructions for getting the app to recognise your Switch+. When you’re done, set up Alexa account for preferences and start enjoying your new device. What can we say about Switch+ function? This is a switch at first place, so let’s first check this feature. Like a light switch, The Ecobee Switch+ works well. It has several ways to control the lighting: pushing the light button manually, by motion sensor control or using voice control. The motion sensor is highly responsive and works without delay. If you are not around, it will turn lights off. This feature is advantageous if you have kids, running around and leaving lights on wherever they go. “Do not disturb” feature doesn’t let lights automatically turn on, for example, at night in your bedroom, while you are turning around in your sleep. With this feature, the motion sensor is turned off. Alexa feature is an excellent addition, and if you don’t already own one, this could be a great introduction of a smart speaker for you. At first, it might seem strange to talk to the wall switch, but it isn’t any funnier than talking to any other home device. Just like to any Echo device, you’ll have to say “Alexa” to wake it up and then tell any question or command. The switch has all Alexa skills integrated, and you can hear the news, jokes, or control any other connected smart device. 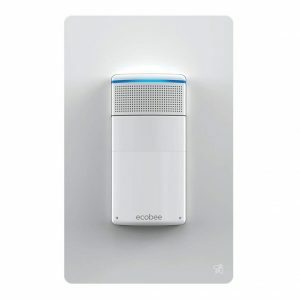 Communication with ecobee thermostats will be available soon. It is a useful feature, because you will no more rely only on the temperature around the thermostat, but will also have it measured on distant places in the house. The Switch+ is not only Alexa integrated. 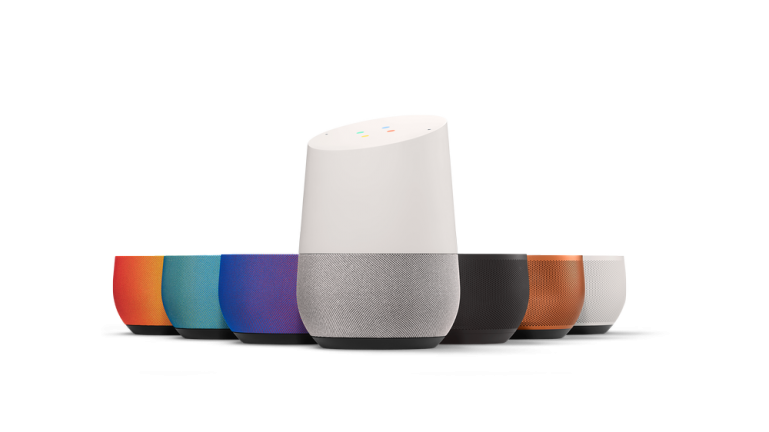 It is also compatible with Apple Homekit, SmartThings, Google Assistant, and IFTTT. 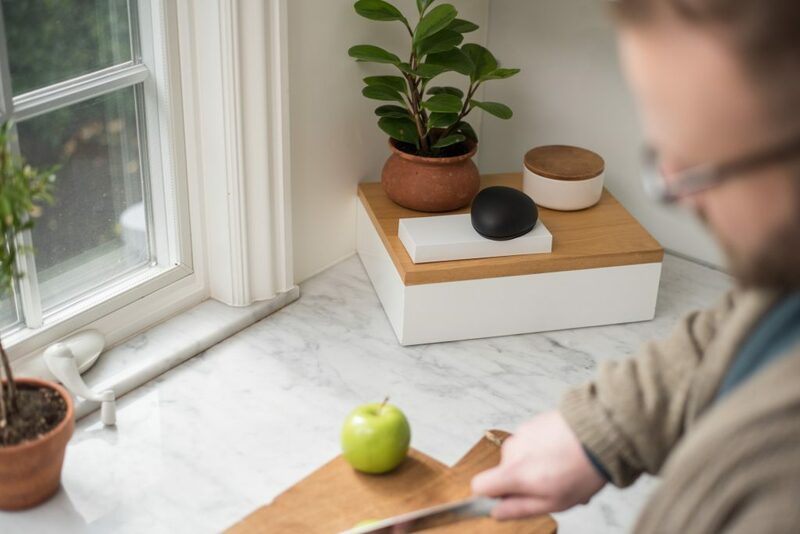 Ecobee’s Switch+ is a great device to have, not only as a switch with a motion sensor but as an Alexa device which will make you see all of its advantages and get one step closer to a completely smartening up your home. On our third place, one of Amazon best sellers, Leviton IPS02, will make you satisfied, even though he does not have implemented Alexa. Still, it will be your friend in need when you enter the laundry room with hands full of clothes or the garage in the night. The Leviton’s IPS02 is fitting standard wall box so you can just replace the standard switch with it. The neutral wire is not required, but you will have to connect it with ground wire. As the sensor uses passive infrared technology, there are several things you should know before installation. The first is that it requires a clear view of the space it will cover, any obstruction will disable detection of the movements. So, the best thing is to locate it in the place with a clear line of view of the space it has to cover. The second thing to keep in mind is that IPS02 works the best in small areas with high levels of motion. The more activity there is in the area, the more sensors will contribute to convenience and energy savings. Additionally, avoid installation in places with strong airflow, as it might be falsely detected as motion. The field of view of IPC02 is 180 degrees, so it completely covers the surrounding area. The coverage of 900 square feet makes it perfect even for a large living room, which is approximately 9mx9m. However, if you need it only for practical purposes, it will work well in basements, pantries, laundry room, storage areas and garages. It is compatible with LED, CFL, and incandescent light. You can set automatic turning off the light after 30 seconds, 5 minutes, 15 minutes or 30 minutes, depending on which room the switch is and how long averagely you are working or staying in. For example, basement lighting would ideally be set to turn off in 5 minutes while a bathroom switch may be configured to turn off 15 minutes after you leave it. You can also program it to work as a vacancy switch: turn it on when you enter the room, and automatically turn off after you leave it. 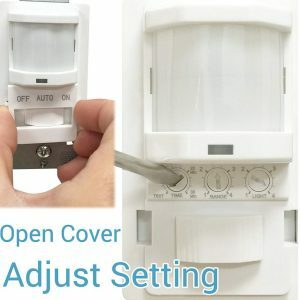 Even though it is not connected smart switch, it is quite useful in earlier listed areas, and with the reasonable price, you might wish to check how a good switch with motion detector works, and later get yourself a more complex one. The third best seller on Amazon, and the second on our list, Top Greener’s TSOS5 might be just what you needed from a motion detector light switch. And when you don’t need this kind of switch, you still have an option to turn the sensor off and have a traditional switch. The installation is easy, and with screwdriver and pliers, it will take you about ten minutes. However, TSOS5 is a bit bigger switch than traditional ones, as the passive IR sensor protrudes from the wall. But with this appearance, it has excellent 180-degree visibility and a maximum coverage area up to 980 square feet. The switch works well in all areas and is compatible with CFL, LED and incandescent light. It has three modes: auto, on and off. 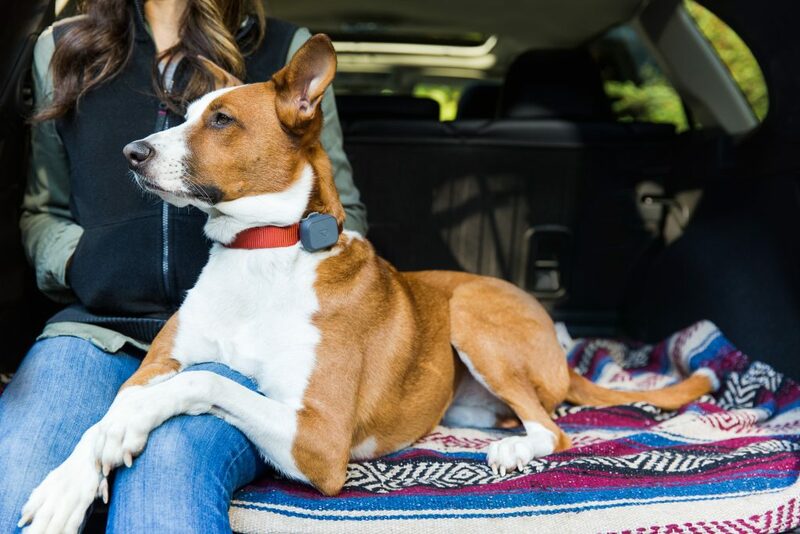 With the auto mode, it works as an occupancy sensor with auto ON and auto OFF features. By using ON and OFF modes, you will be able to override the sensor and use the sensor switch as a regular light switch. The sensitivity of the motion sensor is adjustable in four positions, and you can set it from 30% to 100%. The time after which the lights will turn off if the sensor is turned on is between 15 seconds, 10 minutes, 20 minutes and 30 minutes. Settings for the time delay, range, and light level are easily accessible and adjustable and are placed behind the cover plate. Even though PIR works on a temperature difference between the moving human body and surrounding, reviews of the users show that even in the laundry room when the machine emits the heat it doesn’t turn on. But as an advantage, motion sensors have a unique Fresnel lens which divides the coverage area into zones and enhances the detection of small movements. The overall impression is that Top Greener’s TSOS5 is a good motion sensor light switch which will save you money on monthly energy bills and enable you to manually work with it when you don’t need its motion sensor features. 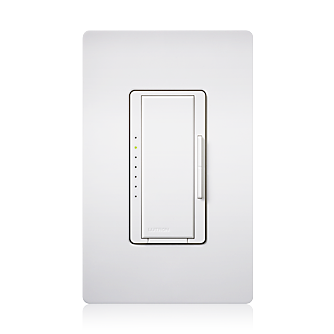 Lutron’s Maestro MS-OPS2 is an advanced option of motion sensor light switches compared to Top Greener’s TSOS5 and Leviton’s IPS02. That is why it is forefront those two, and best seller on Amazon. But, let’s see what puts it in the first place of the bestsellers. Installation of MS-OPS2 is quite easy. It is performed by simple replacement of traditional switches, and it will take you about 15 minutes. Although it requires a ground wire, which standard switches may not have, it doesn’t need a neutral wire, unlike many sensor switches. Setup is also straightforward. The period for switching off after there is no movement in the room is done by holding in the button until it blinks the appropriate number of times prescribed in the instructions. The switch allows you to have the light stay on for 1, 5, 15, or 30 minutes after it doesn’t sense the movement in the area. Even though MS-OPS2 is occupancy switch, you can also set it to be a vacancy one so you will be able to turn on the lights manually, and they will turn off automatically. For example, if you go to the basement, you can switch it on manually, but when exiting with full hands, turning the lights off will be done automatically. However, the load has to be performed manually. But if you eventually wish to change your occupancy to vacancy switch, you can do it for free and without a hassle of new installation. Another advantage of MS-OPS2 is that it has an optional mode for daylight sensing, so the lights only come on when there is not enough natural light. Another good thing is that it can learn what it means enough daylight. What does it mean? Well, you have an option to switch the lights off within five seconds after entering the room if there is enough daylight. Over time, it will learn that there is enough daylight and in future will not turn on the same amount of ambient light. The MS-OPS2 works with passive infrared sensors and has additional Lutron® XCT Technology for fine motion detection such as typing at a desk or reading, ensuring lights do not turn off unexcitingly. Fine motions are detected in the area of 20 feet x 20 feet (6 m x 6 m). The major motion coverage is much more extensive, up to 30 feet x 30 feet (9 m x 9 m). Field of view is 180 degrees. The design is smart and elegant, and the sensor does not protrude as much as in some other models. You don’t have to worry about which type of light you have because MS-OPS2 works with all kinds: halogen, incandescent, ELV, CFL, MLV, LED, electronic fluorescent and magnetic fluorescent. This compatibility simplifies the selection process when buying new bulbs and allows you to use whichever is available if you don’t have the favourite type. With all its features it is clear why the MS-OPS2 is the no. 1 on our list. 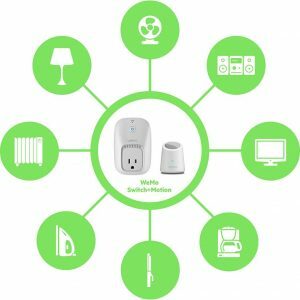 If you don’t really want to get any of connected smart switches with movement detection, this one will fit all your needs for sure. The light switch with a motion detector can really ease your life, not to talk about energy savings in the areas where it is easy to forget to turn off the light. With so many options available, and our list of top five, we are sure that you will make an excellent choice that will suit your needs. 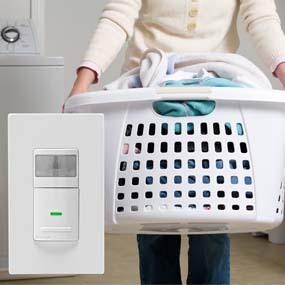 Updated October 2018: We’ve added the top 5 list of the best motion sensor light switches. Updates are underlined for easier traceability. If your bathroom light switch faces the wall you may be waving your arms to reactivate. Microwave sensors “see” through walls so you’ll have lights turning on when not needed. If you are building a new home, skip the aftermarket products and consider a purpose-built system for lighting control. DC lighting and control systems are simple and reliable and don’t need any advanced iPhone controls to turn the lights on. Just a plain old switch or occupancy sensor like you described in this article. However, with many of these systems you can also add sensors anywhere including the lights themselves. Check out LumenCache for example. Very, very informative article on switches with the newly updated product range. Will give them a look. Thanks for the information! Loving the articles here.